Mushrooms have been a well known and traditional delicacy in the African setting. It is a very good dish for nutritious value as well as medicinal functions. They are more nutritious and yet cheaper alternative of meat. Mushrooms are a very good source of proteins, minerals and vitamins. Mushroom growing has taken on the trend of being grown in urban areas due to limited availability of land and space to grow them as any other crop. Land ownership is also a tricky subject in Uganda, thus most of the mushroom growers are doing it on rather a small scale. Irrespective of all that, the requirements for growing mushrooms are not so tedious that one is able to afford growing as much as they want since even the market demand is quite appealing. Hotels, restaurants require good supplies of quality mushrooms from markets as well as supermarkets. Oyster has been noted as the most common grown species of mushrooms in Uganda but some farmers have also been exploring the tasty wild species of mushrooms. The oyster mushrooms have been so far the only wood –grown mushrooms and professionally cultivated in Uganda because the rapid incubation of mycelium can just be attained even in the primitive laboratory conditions. The rapid growth therefore makes it possible to pasteurize and incubate ligneous waste from agriculture without imploring so many preventive measures. The oysters are well known and therefore commonly demanded for as the edible variety. You may venture into growing the other types of mushrooms such as those grown on compost, or the white camp that have a South African origin. These are quite costly although the growers still lack the sufficient knowledge that is needed for their proper cultivation. What Do I need to know to grow mushrooms in Uganda? Most farmers grow mushrooms for home consumption as well as for sale on a small scale. Mushroom farming is not a complex process; it has therefore started attracting even the urban dwellers to help themselves start up something that can bring them some income to earn a living. The wild mushrooms that are not so common today, are usually seasonal and can be grown in wetlands, rotting tree trunks broke soils of banana gardens and anthills and bushes. 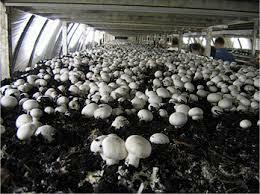 The first requirement to grow mushrooms well is to have dark areas. To make your mushroom garden therefore, you may make good use of your garage, that old store that you rarely use, or even the ceiling. For addition of a little more of nutrients for your growing mushrooms, you will have the husks mixed with maize bran. You are now ready to add your mushroom seeds into the well mixed waste product. You will need to put some holes on the polythene bags in order for the mushrooms to protrude out as they grow. These will also be very handy as you add water. After all that is done, tightly tie the top of the polythene bag, hang it in a dark room or place. 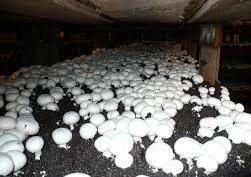 It is important to avoid too much heat in the room as it affects the mushrooms. For every one bag of waste mixture, you will be able to harvest for up to about three months after the initial harvest that comes after 14 days. How do I control and manage the weather, temperatures and growing conditions for mushrooms? Taking an example of one of the mushroom growers in Uganda, I visited and talked to Mr. Mukasa from my village, to him, climate control is quite efficient yet easy at the same time. Using a layer of bamboo to create wide air vents at the top of his old building, that will be safe guarded from wind and any sun. At the same time, there will still be a good supply of fresh air. For ensuring the right levels of humidity, there are sprays. However he also has a local system where the doors made up of a framework that is moderated round a double wire panel. This panel is made up of a wet charcoal layer. For keeping the interior of the building cool and dump, wind keeps blowing through this panel. What is the profitability of mushrooms? What is the price of Mushrooms? If grown, produced and managed well, mushrooms are a very good source of income. 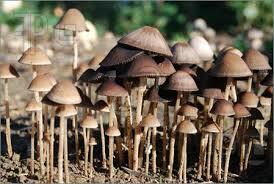 Mushroom growing is now a livelihood for many in Uganda. If you are to sell fresh mushrooms, a kilogram, may earn you about 3500 Uganda shillings which is about 1.5 US Dollars while a kilogram of dried mushrooms will bring you close to 1.2 US dollars which is 3000 Uganda shillings. You will start harvesting after 14 days of growth, but go on to harvest every 2 days until about 3 months. This keeps bringing you more incomes from the same plant. This is because mushrooms are an indigenous crop that is easy to grow yet bring you very quick returns. What are the challenges faced while growing mushrooms? It is true that farmers who grow mushrooms are often not sure of the obvious availability of market for their produce. Lack of dryers. 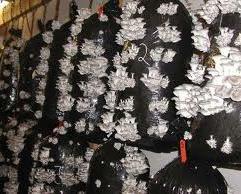 Many farmers have decided to sell fresh mushrooms since they do not have dryers for drying the mushrooms. They may still not have the money to invest in any solar machines for serving the purpose. Mushrooms are well known perishable crops yet farmers still do not own refrigerators since they cannot afford thus risking their products to rot. Lack of information to do with mushroom processing has also come out as a challenge. There is also limited knowledge regarding the nutritional traits of mushrooms among the farmers as well as the consumers. Information about mushroom growing may only be known to just a few groups of farmers involved in the growing process. Many are less informed and hence may not be able to obtain the improved seed varieties. The technologies at research institutions may also need to be fine tuned in order to fit the new farming systems. We still need to know the market in uganda. i want to start mushroom growing at home on small scale, but how do i go about it. Thx for this information i want to start up mashroom business but no clue abt hw to start. Thanks, from EAC , I am looking for a producer of mushroom process machines Tel and email are essentiel. Thx for the information. Any knowledge of how to cultivate JUNCAO mushroom? Thanks for the wonderful article. It best highlights all the essentials of a mushroom growing project. Any details of the export market please?